Cowtown results, 50th percentile YEAH! 599 out of 2031 total finishers. 443 out of 1068 male runners. I am a perfectly average half-marathoner. Onward to the Lone Star Triathlon on March 28. P.S. TNT was well represented. 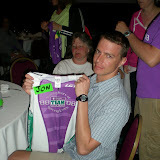 I wore my TEAM training jersey and had lots of "Go Team" shouts from spectators along the way. One marathoner was running in honor of his 2-year old daughter recently diagnosed with leukemia. The mission goes on. You can extend your offer of financial support with a donation here. Fundraising for this season closes March 15. The Iron Man distance triathlon ends with a full marathon. The Half Iron Man distance (for which I'm training) ends with a half marathon. I've never run a full or half marathon distance either in a race or a training run. For mostly psychological reasons, I decided to opt out of our team's weekend brick workout and instead to run the Cowtown Half Marathon this Saturday, February 23, 2008. Bricks are great training - they combine cycling and running elements in race like conditions. They're great at conditioning your legs and heart. What I need is a specific kind of mental conditioning. I need to know what it feels like to run 13.1 miles. 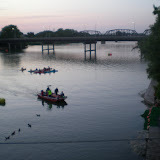 Plus, the Cowtown promises to be a fun event - bigger this year than ever before. You've probably noticed the pervasive and deep links between amateur endurance sports events and charitable and social causes. The Cowtown is affiliated with the University of North Texas Health Sciences Center and serves to promote health awareness in the community. Pretty cool. 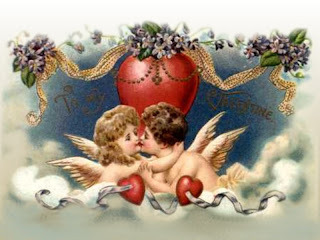 Here's wishing you and yours a love filled day! Expenses due to catastrophic health care costs are among the tops three causes of personal bankruptcy filings (the other two are loss of a job and divorce) - Source, BBC News. The employer based health care system in the US struggles to keep pace with unrelenting increases in health care costs. The answer: shift more of the burden back to the employee. It's a trend to which we can all relate. Among the most pressing issues in our current presidential race is who has the best plan to address the problems of health care in America. Very few of us have enough in the savings account to deal with a true health care catastrophe. Insurance seems to be less and less of a safety net every year. Perhaps our government will play a bigger role to everyone's benefit. One thing is clear, America's non-profit organizations carry a huge load in meeting the needs of those among us stuck hardest by disease and which require prolonged and costly health care. It's a strength of our country we should be proud of. Financial Support is a big part of the mission of the Leukemia and Lymphoma Society. Help in this mission. Donate to the Leukemia and Lymphoma Society. Pay it forward and hope you never have to cash in that good karma (yes I know that's a very bad mixed metaphor). 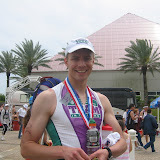 Salesman, Marketer, sporadic blogger, volunteer, age-group triathlete.